Coined by Jürgen Habermas the “Public Sphere” is the space in which people gather as a collective to explore and discuss issues occurring the society through free speech and conversation, it is separate from the state and the official economy, and is egalitarian and open. This is evident in today’s contemporary entertainment such as the television show “How I met Your Mother”. Whereby like Habermas’ idea of a coffeehouse-like context by which individuals are settled in a small group of the ‘elite’ are conveyed through working class characters resided in New York city in their local bar, sparking up debates, topics and situations that happen on a day to day basis affecting different individuals per episode. Those familiar with the show can therefore relate to the issues presented allowing this form of pop-culture to be the voice and influential opinion that shapes their views and beliefs on certain deliberations. This article outlines the diverse ways in which mass media through popular culture develop control over the audience which can relate to this theory of the public sphere and what it stands for. The public sphere has therefore altered through time through which it’s physicality with an audience. To get the ball rolling let’s take Twitter for example as the ‘Public Sphere’ in which people are generally free to voice their opinions and thoughts to the world. Tweets, pictures, links and of course the famous #hashtag that links individuals all around the world on common societal grounds, debates and interests making it easier to participate in the public sphere, in today’s media it can take one single individual to create the next viral and trending topic through the power of the hashtag. This is evident in the the hashtag (#iwillridewithyou) that supported the Islamic minority in Australia following Sydney’s Martin Place siege whereby it struck fear in society as one mentally unstable criminal used one aspect of the religion which then encouraged hate and resentment. The message rising by hundreds of tweets per minute – within hours it had been used in almost 120,000 tweets, this exemplifies the revolving cycle in which the public can contribute to in a berserk debate that affected hundreds of thousands of people. The flourish of content within the ‘Twittersphere’ are therefore debated no matter what it’s seriousness is and with a click of the screen you can re-tweet information that one may think is interesting, true or condescending. Everyday discussions are raised and with this the public sphere is put into motion, over the advancement of this space it has become a lot more mediated as views are thrown left, right and center, this can be displayed through Facebook whereby content such as the topics of ‘#freethenipple’ and ‘Breast-feeding in public’ have been flagged creating altercations online. Do you think this mediation is fair? By some extents it covers touchy subjects with a big blanket which cannot present a resolution for the arguments. Jürgen Habermas’ idea of this public sphere has therefore been used as a firm foundation in which a generative media platform such as Twitter and popular culture represented through ‘How I Met Your Mother’ have been built upon. Resulting in a contemporary mediated public sphere. Let me know your thoughts guys! Underlying every newspaper article, upon printed and digital images, linger the most influential people in Australia’s news, and they are the Murdoch’s, the Gordon’s, the Packers and Kerry Stokes. Mass communication media within Australia singles out these handful of individuals regarding it’s ownership, Australia’s largest media company is Rupert Murdoch’s ‘News Limited’ which controls ‘The Daily Telegraph’, ‘Herald Sun’ and of course ‘The Australian’ whereby they are the main newspaper platforms, along with the hoards of online sectors such as ‘news.com.au’ just to add the sugar on top. Though generative media is taking over giving the power to audiences no matter where, legacy media (that of Rupert Murdoch owns) still influences consumers, funneling content which individuals as powerful as old Rupert over there ultimately controls. The question is, does this mass ownership of media matter to the citizens of Australia? And the answer is YES. With Rupert Murdoch having these platforms in the palm of his hands, he can pick and choose according to whatever context what we as consumers are taking in and with his ownership of diverse forms of distribution we cannot escape it without some form of exposure. For example Murdoch’s newspapers and sites post articles targeting particular individuals, in regards to politics, he did just that to Kevin Rudd towards his claims on the National Broadband Network (NBN). After the 2010 election, which resulted in a minority Labor government. 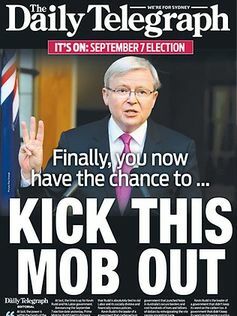 Murdoch made clear to his Australian editors and senior journalists that the Gillard government was inept to run the nation hinting that Abbot was the man for the job. His newspapers (whereby he previously supported and built upon the Gillard leadership in 2010) campaigned strongly against the Gillard government, pin pointing the the major issues within the country including asylum seekers and climate change. It does matter who owns the media, especially in Australia though, to what extent? Through political change within the nation sparks conflicting perspectives between the big players that is our media and their controllers. Will we as people, be able to have the same effect on the media as these media icons? Sounds super complex eh? well it is. To cut it short, Semiotics is ‘the study of signs’. The first thing that pops into your head are signs that we see on a daily basis such as road signs, but do you really study them day to day? Though there is much more to it, identifying the obvious is barely scratching the surface. Photos and typical art such as paintings and sculptures? That too, but semiotics encompasses all of these aspects throughout life including every form of language in today’s society. Ferdinand Saussure and Charles Sander Pierce where the main contributors in the founding and development of this study and when you really think about it, it’s amazing how everything can be perceived in so many ways by an individual. Was your answer a ‘Pipe’? Sorry to tell you but you are wrong, it is a representation of a pipe and it is evident in the caption underneath written in french translating to “This is not a pipe”. Painted my Rene Magritte 1929. Do we believe what we are seeing? Or the denying language underneath? Magritte seems to be challenging the responder conveying a rejection of the presentation, you cannot easily deny the painting is a pipe or what it is representing. How would you read this sign? The image denotes a person shown on a railway track with an oncoming train. It looks pretty simple but if you really think about what may be happening, so many situations would be doing laps in your brain. To me, it’s showing a person on the tracks with a train heading straight for them, it gives off a sense of hopelessness see how close the train is and how helpless the man or woman is and I think this is what would be typically interpreted by an individual first seeing the image. Do you know if the train is heading towards or away from the person on the tracks? The person may have climbed down onto the track intentionally, we do not know the emotional stability of the person. If the image was taken by another individual, you would think there would be other senses of urgency rather than to grab their camera and take a snapshot. Therefore humanity could be questioned immensely in the actions taken if this situation is in fact life threatening and no aid is evident, has technology got the better of us? You can never be too sure when interpreting a sign no matter what format. Tell me what you perceive from this image, or post an image and tell me what you see and I will respond with my interpretation. Media is changing the way the world thinks, acts and basically function. As humans we tend to adapt to what we see on the media, whether it is positive or negative and a lot of the time we don’t notice that we are doing it. This places the audience in categories, whereby we are more inclined to be sucked in to these shams. A touchy topic for many individuals can be identified through the portrayal of body image in the 21st century. Depicted through the media showing the ‘typical’ model which has been altered throughout the ages and now in more contemporary time being compared to ‘plus-sized’ models (so to say) and the debate that is evident between them. These depictions can be seen as a dangerous way to promote body image on both sides of the spectrum and creates friction with peoples opinions and scientific research. What is the ideal body image in today’s world? It cannot be defined as it is constantly being altered by the people (which is ultimately us) and the media who are doing so to spark controversy and make the big bucks. You can’t hit the nail on the head cause it isn’t evident and if you did you offend a large collective of people. Kids are growing up with a fixed thought about how they should look because its shown right after after an episode of Sesame Street. Pop culture and it’s manipulation is brain washing the audience, identified as the gullible, easy influenced, child-like and it’s working to an extent, it can and is definitely seen as dangerous media eating away at people’s process to think. Do you think media can be dangerous? If so, in what way(s)?